Based on the story of Picus, a king of ancient Italy, “Woodpecker with Verse” shows a woodpecker sitting on a fruit tree branch. 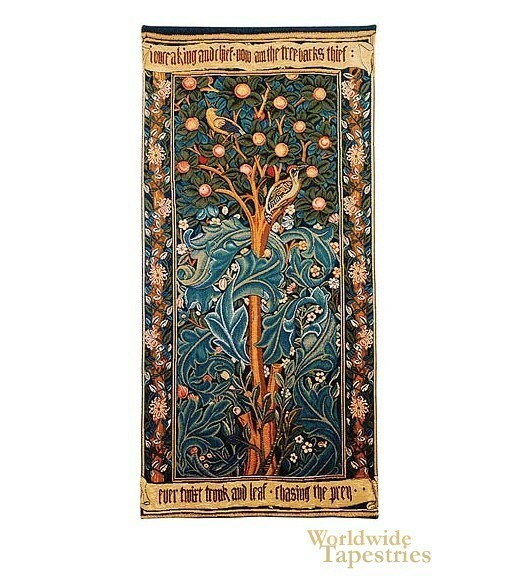 While most of the Morris & Co tapestries were jointly designed, this one was designed by William Morris alone in 1877. It captures his attention to detail and brilliant artistic flair perfectly. The inscription above and below reads: “I once a King and chief, now am the tree-bark’s thief – Ever ‘twixt trunk and leaf, chasing prey”. William Morris fans covet this work, because of Morris’ involvement in not only its design, but its production as well. It was obviously a labor of love for Morris. The original can be found on display in the William Morris Gallery in London. This reproduction, based on the original "Woodpecker with Verse tapestry" is lined and has a tunnel for easy hanging. Dimensions: W 19" x H 40"
Dimensions: W 29" x H 61"